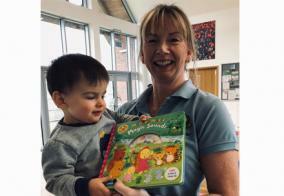 Congratulations to Samuel who won our 'Clever Little Monkey' competition last month! Here he is with his teacher, Samantha and his prize, a copy of Monkey's book with CD, Magic Sounds. For your chance to win, log in to the Little Monkey Club and click on Competition Question! Good Luck!